Congratulations to Matt Matros, Winner of Event #52: $2,500 Mixed Hold'em ($303,501)! Matt Matros was crowned winner of the $2,500 Mixed Hold'em event, earning his second career bracelet. 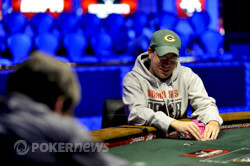 The Limit Hold'em specialist won the $1,500 Limit event last year. He has come close to another final table twice already this year, finishing 12th in the $2,500 Limit Six Max event and 11th in the $1,500 Limit event that he'd won in 2010. This time he went all the way and now has the double gold to prove it. This was one of the few events that reached a final table by the end of Day 2, so it was only the final nine who sat down at the felt this afternoon. Adam Sanders was the first to make his exit in ninth place, followed by Aalok Arora in eighth. Dutch pro Noah "Exclusive" Boeken then fell in seventh place. 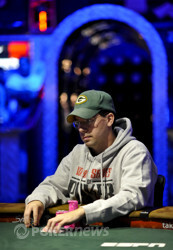 After three quick eliminations, the final table stalled at six. After some back-and-forth, Russian Nikolay Losev was eliminated in sixth place. Matros was extremely short at the dinner break. But after dinner it was Brian Smith who exited first, in fifth place. Matros doubled and doubled again. Brandon Meyers started the day with a big chip lead, but with the limit rounds of each hour playing so big, every player experienced wide swings. 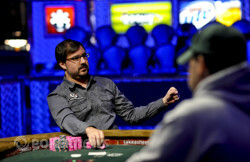 Meyers, who plays as "norajean" online, had the biggest lead of the tournament after one particularly dominant round of four-handed no limit. During the next round of limit, however, he got run over by limit experts Matros and Matt "Hoss_TBF" Hawrilenko. He was the short stack when they made it back to no limit and got his chips in with queens against the kings of Matros to finish in fourth place. And then there were three: bracelet-winning limit hold'em experts and good friends Matt and Matt, and Jonathan Lane, a relatively unknown player who is having a fantastic series. Matros knocked out his good friend, Hawrilenko, in third place, making a flush to best Hawrilenko's two pair in limit hold'em. That gave Matros a 3:1 chip lead to start heads up. Lane fought valiantly, even taking the lead at one point, but in the end, it was Matros who won the day. 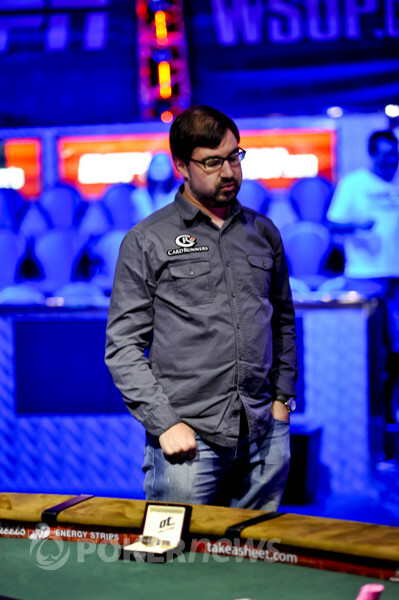 Lane earned $187,844 in his fifth cash of the Series a week after finishing sixth at the final table of a $1,000 No Limit event. Matros was all smiles with his $303,501 and his second career bracelet. Matt Matros does a remarkable job coming from last in chips at the dinner break out of five competitors to capture the WSOP gold bracelet in event 52. Matt Matros opened for 65,000 on the button and Jonathan Lane shoved all in for the rest of his short stack. Matros called and the hands were tabled for the showdown. Matros' hand held and Lane was eliminated in second place. 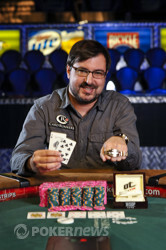 Matros claimed his second WSOP bracelet. Matt Matros celebrates making a nice call. Matt Matros opened for 75,000 on the button and Jonathan Lane called. The flop came , Lane checked, Matros bet 75,000 and Lane raised to 250,000. Matros called and the came on the turn. Both players checked and the river came . Lane slid out 500,000 and Matros went into the tank. Matros was visibly pained by the decision and after a few moments announced call. Lane turned over for a stone bluff and Matros tabled and took a decisive pot. Lane was only left with about 850,000 after the hand. Jonathan Lane opened for 55,000 on the button and Matt Matros raised to 225,000 in the big blind. Lane called and the flop came . Both players checked and the came on the turn. Matros check-called 225,000 and the river came . Matros checked and Lane checked behind. "Great check," Matros said as he tabled for trip queens and Lane mucked. Jonathan Lane opened for 80,000 on the button and Matt Matros raised to 225,000. Lane called and the flop came . Matros checked, Lane bet 275,000 and Matros moved all in for 1.4 million. Lane tanked and said, "You'd hate me forever." He counted out a stack to call and was pained about his decision. He eventually said, "I can't do it," and tossed his cards to the dealer. They are virtually even in chips after Matros took the pot. Matt Matros raised his button, and Jonathan Lane called. Lane check-called one bet on the flop. He checked again after the turn, but this time he stuck in a raise after Matros bet. Matros called, then called one more bet after the river. Lane showed for the turned wheel to take over the chip lead. The final two get 20 minutes off, so you do too. Matt Matros exhales after his victory.